I always seem to be writing about my new latest finds, but I think from time to time I'm going to try to shine some light on products that are already in my stash. I first purchased this in an effort to rescue my poor nails from months of acrylics - and I was looking to be a lil more el natural with the nails. That was the initial thouth behind the purchase - but this product has turned into a must have for me. I like for 2 main reasons, it has the most amazing citrus smell ever, and it really leaves my hands soft and smooth after a minute- and that's about all the time I really have for things like this. 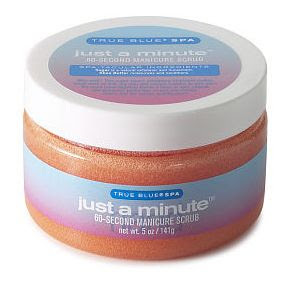 Quck Tip: I use this as a full body scrub from time to time when I really want a pick me up! Thanks to the very lovely Tiffany of I am Style-Ish I have received my very first blog award. If you are not familiar with her blog (see link above) or her photography site www.Style-Ish.com, I suggest you get over there right away. 2. Had dinner with my dad as a Pre-Father's day celebration since I won't see him this weekend. My list is a little random, but I have had a very hectic week. I'm staying with my parents for a little while and they are having some remodeling done - fun but hectic. This is a lineup of what I would use within a 7 day period. I do not use all of the products in one day - as I would have no time for anything else if I did :) But this is simply a peek into my bathroom sink to see what I have and what I like. I do use a lot of natural treatments for my face when I get around to it. If you lovely readers are interested I can share of few recipes that I have picked up and that have come down to me from my mother and other relatives. This is just a few of the things I am currently using. What are some of your MUST HAVE skin care products? Living in California, the summers are hot! and I am always on the lookout for an easy but efficient daily SPF. Currently I use a daily moisturizer with SPF in it: Cetaphil daily lotion with SPF 15. So its good - but its not really the right amount of protection I need against 101 temperatures. I used the BM foundation last summer to touch up my face and add some SPF protection, but it adds too much coverage and I just want something a little more natural looking. What do you reccomend :) ?